When I was much younger (don't even go there!!!) amongst the many and highly diverse career choices I contemplated including journalist (now disillusioned), archeologist (is it too late? ), air hostess (too short!) there was a desire to create fantastic window displays, I know, go figure!! I still love looking at them and silently judging.. 'no surely not, you're never putting that with that, what are you thinking!!' you know that sort of thing. Hmmm! maybe it's not too late for this.....!! This is one of the shiny new shops on the ground level of the building known as 140 William Street, more about this building on a more serious note tomorrow. I'm not sure what attracts me to this picture so much, I think it's because it looks as if some giant hands have scooped up an assortment of various yachts and sailing vessels and just 'dropped' them into the harbour. To me there seems to be no order, but in fact I'm sure all concerned know exactly what's what, I understand that pens at the marina are extremely costly, and in very short supply these days, in fact if you are trying to sell a boat unless it comes with a pen, you don't have buckley's!! Thank you so much for all the good wishes about my eye, the patch is off and all is well except for the occasional urge to yarrrr! Apologies for lack of commenting yesterday and today, have had a small eye op resulting in wearing an eye patch for couple of days, side effects include a fair bit of 'yarrr me hearties! shiver me timbers!' and other such like pirate talk, but mainly it's just uncomfortable and hard to type accurately, back to normal tomorrow hopefully. I went up to King's park at the weekend to take some shots of the fantastic old trees up there, as I was leaving I couldn't help noticing a lady sitting on a rug with her gorgeous little dog enjoying the view of Perth. We started chatting and she told me her little companion was called Sammy after her favorite Doctor who was called Samuel, and that Sammy was 12 years old. She was very proud of Sammy and wanted to show me some of her tricks, but just like a child Sammy wouldn't perform to order no matter how much her owner cajoled and pleaded..then just as we were chatting and I was about to leave, we turned around to see Sammy sitting up and looking as if to say "well isn't this what you wanted!!" I had to whip the camera up pronto, before she changed her mind, she was well rewarded with a 'doggy treat'. There I was, trying to find the best angle to take my shot of Ascalon when a man tapped me on the shoulder and said "do you know where you're standing? ', Well yes....!! on the corner of Victoria Ave and St. George's Terrace..!! "Look down" he said, "you're missing something". I can't believe I missed it, there I was standing on Point Zero, which I guess is no big deal, but still kind of interesting. It is the origin point of all distances measured from the city of Perth and consists of a small grey plaque above ground level, which apparently unknown to moi has been there for decades, while the gold lettering on the ground level as been added fairly recently, it does look new and a little bit 'touristy'. It was deemed 'the spot' in 1925 as it was the site of the first post office in the State. Not quite as exciting as a clue in the Da Vinci Code, but we are talking Perth here.....!! In 2009 the Dean and Chapter of St. George's Cathedral commissioned Marcus Canning and Christian de Vietri to create a contemporary sculpture using St. George and the Dragon as it's theme. They designed the very dramatic and striking ASCALON...the lance that St. George used to slay the dragon (The story ofAscalon).It was completed and installed in the grounds of the Cathedral in 2011. The reason for this theme and choice of sculpture is to represent that age old belief that 'good always wins over evil'.. here's hoping.....!! Tomorrow I'll show you where I took this photo from and why it sometimes pays to look down as well as up when you're on the hunt for a picture.....Have a great Sunday. Being silly never felt better.....!! Is it a bird, is it a plane.....?? Perth would appear to be, to the traveler, a place of romance: the 'City of Light' acclaimed by the astronaut John Glenn who, orbiting the earth overhead in his Mercury capsule in 1963, claimed to have seen 'the tiny glow on the south-west tip of the great black southern continent,' as its inhabitants left their lights on through the night in honor of Glenn and the United States space program. 'I can see lights on the ground,'Glenn reported. 'I can see the lights of Perth on the coast. Thanks everyone for turning on the lights. I know there are cities many more times illuminated at night than Perth, it's just the fact that we are all alone way over here at the other side of a very large continent that highlighted the vision. This was taken from the South Perth foreshore when on an excursion with my friend and sometimes mentor!! This sculpture that sits on the path leading through the Perth Cultural Centre towards the Art gallery has always caught my attention. It's very tall and the face is a little bit scary looking, although I don't think it's meant to be, it certainly didn't seem to be intimidating the group of schoolchildren sitting on the steps. The sculpture is dedicated to 'the plight of torture victims' and was designed by Gerhard Marcks and cast in bronze in Berlin by Giesserie Barth in 1981. I haven't been able to find out exactly how tall this sculpture is, but I do know that it seems to be impossible to take a picture of it without the sun glaring around the head area and causing an effect that to me looks like 'breathing on a cold day', or is that just me being a little fanciful? Oh and that is actually the name of this piece 'The Caller'. It's officially winter here in Australia, and even though it was wet and extremely windy yesterday the temperature was still a mild 19C . I spotted these two young people frolicking as I was driving past Sorrento Beach, I pulled in and took a few pictures of them having great fun while Mum and Dad were bundled up in jackets taking shelter from the elements! Why is it that young people don't seem to feel the cold....oh heavens, how old does that make me sound!! And the teardrop on a lovers cheek. Anon. The original HMAS Perth was recommissioned in1939 and was used to patrol Australian waters before being sent to the Mediterranean at the end of 1940. In 1942 HMAS Perth was torpedoed and sunk at the Battle of Sunda Strait (War history HMAS Perth). The bell to the left is from this ship. The HMAS Perth (D38) was built in the USA in 1965. The destroyer was used in the Vietnam War earning honours and commendations for her service. (HMAS Perth (D38)), after this she was used mainly for training exercises before being sunk as a dive wreck off the coast of WA in 2001. The bell to the right is from this ship. 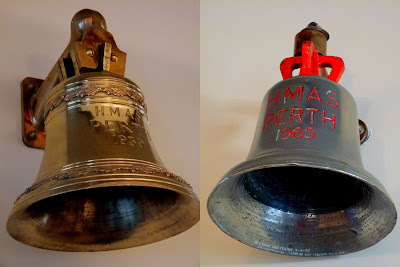 Both of the highly polished bells hang in the Perth Town Hall watched over by proud concierge who will if you have the time regale you with tales of the sea. I did have time and I enjoyed every minute. As you climb the hill up to St. Mary's Cathedral you get the first glimpses of the Gothic design building through the arch of an amazing Morton Bay Fig tree with branches that span right across the road, the root system which you unfortunately can't see here is enormous. St' Mary's Cathedral (history St. Mary ) has gone through three major stages of development, the first stage 1865 - 1930, second stage 1930 - 1999 and the third stage 1999 to the present. At one point in the renovations, the entire roof structure had to be temporarily hoisted off and then re-attached to a permanent steel structure, unfortunately you can see the steel pillars, but I guess it had to be made safe .It has quite a colourful history including Bishops bodies being discovered under the floorboards in the aisle. If you're interested in knowing a bit more of the history the link above is very illuminating!! Happy Sunday. It was 'Purple Bra Day' in Perth yesterday, and no it's not a special once a year day where men of all shapes and sizes can disclose what they really wear under their manly T shirts haha! It's a yearly event to raise money organized by Breast Cancer Care WA, a fantastic charity which provides practical, emotional and financial support to men and women who have been affected by breast cancer, and because of the generosity of the WA public, these services are provided free of charge. This year they reached their target of $250,000 made possible by the hard work of volunteers like my two willing subjects above, and their troop following up behind. I take my bra off to them, they did a fantastic job!! A while back Jack did a post about community gardens and it made me think of the Art Gallery. You might wonder why that thought association occurred, it's because it reminded me that the last time I went to the Art Gallery (you can just see the corner there to the left) the community garden at the side was busy and flourishing and that I didn't make time to take photo's. I went along this time thinking I'd take pictures of both, but it turns out the Art Gallery is having restoration work done and unlike in Paris the scaffolding is not made to look attractive in any way, just plain old uninspiring scaffolding...so, I might come back for that picture. To cut a long rambling story short, this is our community garden (there are probably others),the raised beds are planted with all sorts of vegetables, herbs and fruit trees, and because it's up a level from the city, the view is pretty good. Shame about the graffiti on the sculpture. Oh and one last thing, I noticed mon amie Marie seems to have an extremely long pointy finger....just saying!! The Cloisters (History of The Cloisters) is wedged between highrise buildings on St. Georges Terrace in the city, and is considered one of Perth's most valued heritage buildings. It was designed in the classic Victorian Tudor style in diamond design hand made bricks by Richard Roach Jewell and built in 1857 for Matthew Hale, the first Anglican Bishop of WA who opened Bishop Hale's Secondary School for boys, the school's most successful student was John Forrest who became the first Premier of WA. Over the years it has been used for many things, boys school, girls school, boarding school, university hostel and barracks to name a few. These days it is part of the BHP Iron Ore office complex. It has a few times almost been demolished to make way for newer buildings, but has survived hopefully for another hundred years! These people sitting here are literally a stone's throw from the source of their dinner! They are in Kailis Fish Market Cafe (Kailis Cafe), this is a great link as it gives you a short video that shows a bit of the atmosphere in the Kailis Cafe. It's been around since 1928 and the reason the seafood is the best and freshest is because if you notice the big blue boats lined up in front of the cafe, well they are the Lobster Fishing Boats that have probably just come in that morning, can't get fresher than that!! Who doesn't enjoy piping hot, freshly caught and cooked fish (or whatever seafood takes your fancy), a squeeze of lemon and some chips splattered with vinegar and salt? A quarter of pear drops please.....!! The British Lolly Shop was opened in Perth in 2002 by an English (of course!) couple Eddie and Deborah Croft. The idea came from fond memories of growing up in England, saving up their pocket money and heading to the local sweet shop, to make the big decision of what to pick from the many rows of jars filled with brightly coloured sweets. I still have the same problem today.... surely not just me!! The idea became so popular that they have expanded and now have shops in Kings Cross and Darling Harbour in Cairns and in New Zealand. I wonder...will we ever grow too old for the lure of the jar filled with coloured sweets, I hope not!! A little bit of Paris.....!! I went into Leederville with my niece today. It's impossible for me to go to Leederville without popping into Francois for coffee and pastries! Francois has been around since 1998 and is the best French Patisserie in Perth as far as I'm concerned, believe me I have done the research! It's in a car park just off Newcastle St. and relies on it's reputation to be found. It is an elegant little cafe with a very French look. Gild mirrors, small tables, bentwood chairs, glass cabinets filled with delectable hand made delights, sweet and savoury tarts, le pain of all types. It didn't take me long to become addicted to their almond croissants and these days my order is almost always 'un cafe noir avec le lait chaud au cote et un croissant d'almonde s'il vous plait'......It's so hard to restrict to just the one!!! Aqwa World, The Aquarium of Western Australia (Aqwa) as it is today came about as a result of a diving mishap. The founder of Coral World, Morris Kahn damaged his eardrums while trying to stop his son ascending too quickly. Finding himself unable to dive again he began thinking of all the others who might never get a chance to see life under the ocean and so started the family business of building aquariums around the world (it's an interesting story, the link will fill you in a bit more). Standing on the revolving floor that does a circle around the aquarium with the many species of West Australian sea creatures swimming over and around you is quite an experience. There is nothing quite like seeing a huge white pointer, razor teeth bared swimming so close you could reach out and touch it to confirm to me that my choice of 'landlubber' for life was so the right way to go. If you like a thrill (?) you can even dive with the sharks...........PASS!! In the summer this jetty is a hive of activity. Even though there's a sign stating 'No jumping off Jetty', well.. all the kids do, it's perfect for jumping off and no one ever seems to be around to enforce that rule. In the evening there are usually fishermen sitting here and there along the length of it. In Winter, this is what it looks like most of the time, I thought that the sky might be appropriate for Skywatch Friday! Leavin' on a jet plane......!! I took my daughter out to the Domestic Terminal(Perth and /domestic Airport) yesterday to catch her flight to Canberra, that's her waiting to board her plane. That's her Qantas (Australia's most well known airline) plane waiting for takeoff. Qantas (Qantas facts) has had a lot of flak lately, there was a period when it was in the news headlines all the time with one problem or another and if you look at the stats it went from being rated the 2nd best airline in the world in 2005, to 7th best in 2010. Even so, there haven't actually been any crashes or deaths, just I should imagine some very anxious moments, I'm getting anxious just thinking about it!! Bottom line is that Qantas is probably still one of the safest ways to travel...if you really have to (or is that just me). It doesn't matter how big or how grand your boat is sometimes you need a bit of rescuing!. I took these photos from the lighthouse at the Marina last night. As he passed heading out to sea to perform another of the many rescues they attend each year the Captain of the Whitfords Volunteer Sea Rescue (Whitfords Sea Rescue) gave me a cheery smile and a wave. When they returned later with boat in tow, the lady standing forlornly on the prow staring straight ahead, was probably cold and definitely not amused!! The Whitfords Volunteer Sea Rescue is the biggest sea rescue service in WA and have been around for 35 years performing anywhere up to 300 rescues a year. Bravo to them I say!! I went down to the Marina (Sorrento Quay) yesterday evening to see if I could catch a quick shot of a glorious sunset, there was one but unfortunately it didn't wait for me, slipping down below the skyline just as I arrived, I misjudged the time by about 20 minutes. Not to be put off I walked over the bridge to the cafe side of the harbour to see what the locals were up to on this chilly evening. Well as expected the ice cream parlour was empty apart from the owners looking a bit disgruntled, definitely not a night for ice cream (11 degrees!!). Meanwhile round the corner........ San Churro (san churro) was humming!! I think it's a world wide franchise so I'm betting you all will have tasted for yourself the many chocolate delights within a San Churro, the hot chocolate drink, perfect for a chilly night, is excellent! I stopped in and picked up three different types of chocolate cake to take home, thus ensuring my status as 'best mum' for at least one more night!! Even graffiti artists need a coffee break! This guy was busy in the Murray Street mall, he had his radio, a pretty young lady to chat too and a gorgeous sunny day, he was a happy man indeed! It's fantastic that graffiti has become more accepted as an art form, it has cheered up many an ugly building. On the other hand it is not so much fun when 'tag artists' leave their signature uninvited on freshly painted surfaces that would prefer to stay unmarked. I will have to return to the scene this coming week end to see the finished result of the work above. p.s. if you zoom in on the two cross beams, fun little tags on each! I've been asked to take family and portrait photos for a 90th birthday celebration next week, so I've been practicing on any willing (and in some cases used bribes on the not so willing !!) volunteers to get some ideas before the event. I won't indulge and post all of my efforts, just this one because I'm really happy with it. Back to Perth 'goings on' tomorrow!! Do you know this man....? That's the newspaper headline on the ground by his hat. His name is Percy Button and he was a much loved Perth street entertainer from the 1920's through to the 1950's. He did somersaults and handstands to entertain people when they were waiting to go into the many theatres that were along Hay St. . He was apparently a bit of a grubby chap, and the local paper at the time, The Mirror cleaned him up and dressed him in top hat and tails and ran a competition to see if anyone could recognize who he was, offering a guinea prize! He came to a bit of a sad end when he was beaten up by thugs, not really ever recovering from the experience . His story is really interesting and you can read it by clicking this link (Percy Button). Also you can tell by the shopping bag peaking out from behind the statue that my daughter has just been to one of her favorite shops Alannah Hill.. it could be that that is making her smile, or it could be that she has her face in a place that might (but probably not) have Percy Buttons blushing!! As a postscript to yesterdays theme...when my great nephew comes visiting, he naturally seems to gravitate towards my computer, a bit like a homing pigeon, which begs the question, ' how young is too young to start with computers?' We live in a fast paced gadget filled world, is it best that they get with the program early or get left behind? Meanwhile, it would probably have been best for my computer if I had stopped him pressing buttons, but it was much more fun to grab my camera and take many, many photos of him looking exactly like he knew what he was doing.... he's two by the way!! I went into the city on Sunday with my daughter and a good friend to have a wander with our cameras, drink some coffee and maybe check out a bookshop or two...well isn't that what you do on a Sunday!! Not so it seems, half of Perth was in the Apple Store checking out the latest gadgets. I haven't seen so many people crammed into one small space like that , even spilling out onto the street in front, well at least not since I walked past The Moon and Sixpence pub further down the road !! Just walking past the shop my brain went waaaaah! too many electronic vibes coming out of there for a technophobe to assimilate!! There is a lot of construction going on in Perth just now so there was no shortage of material for this months theme day. This amazingly futuristic looking construction on Wellington Street is going to be the Perth Arena, Perth's biggest indoor entertainment and sports facility. If you click this link you will see what it will look like when it's completed, quite fantastic (Perth Arena when complete). It's been in progress for over a year now and it could be at least another at this rate until it is completed. Standing a little way further down Wellington St. is the now boarded and closed up Entertainment Centre, I have many happy memories of watching The Wildcats basketball team play home games there and also concerts, hopefully the new arena will be able to live up to it's memory.